A Middle School Survival Guide: masks of symmetry. Well, the idea has resurfaced for Halloween here at MathWire. 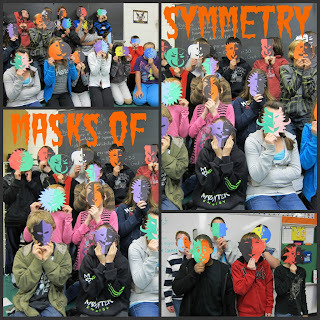 Here is a picture of students "wearing" their symmetry masks. The great part is that this activity can be used any time or for any event! Those look GREAT ! And what a fun way to spend the holiday. ;) Thanks for posting at Math Monday.